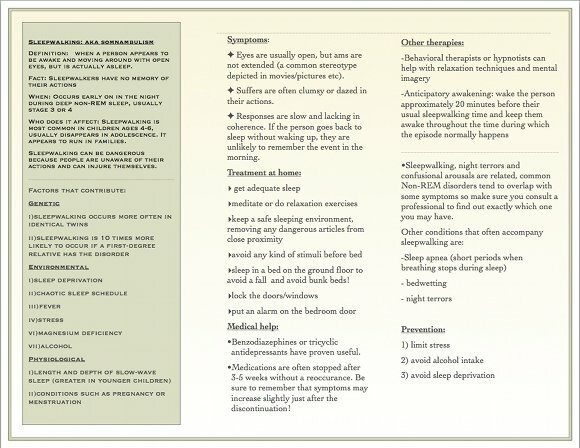 The following is a brochure created for Stanford Sleep and Dreams. If it is difficult to read using the images, you may view the text here. Sleepwalking was first used as a defence in a murder case in 1846, where the jury found the man not guilty! Definition: when a person appears to be awake and moving around with open eyes, but is actually asleep. When: Occurs early on in the night during deep non-REM sleep, usually stage 3 or 4.
Who does it affect: Sleepwalking is most common in children ages 4-6, usually disappears in adolescence. It appears to run in families. 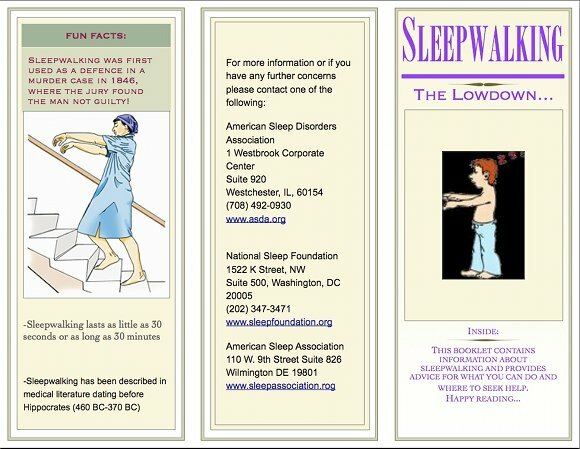 Sleepwalking can be dangerous because people are unaware of their actions and can injure themselves. Eyes are usually open, but ams are not extended (a common stereotype depicted in movies/pictures etc). Suffers are often clumsy or dazed in their actions. Responses are slow and lacking in coherence. If the person goes back to sleep without waking up, they are unlikely to remember the event in the morning. sleep in a bed on the ground floor to avoid a fall and avoid bunk beds! -Benzodiazephines or tricyclic antidepressants have proven useful. -Medications are often stopped after 3-5 weeks without a reoccurance. Be sure to remember that symptoms may increase slightly just after the discontinuation! Sleepwalking, night terrors and confusional arousals are related, common Non-REM disorders tend to overlap with some symptoms so make sure you consult a professional to find out exactly which one you may have.